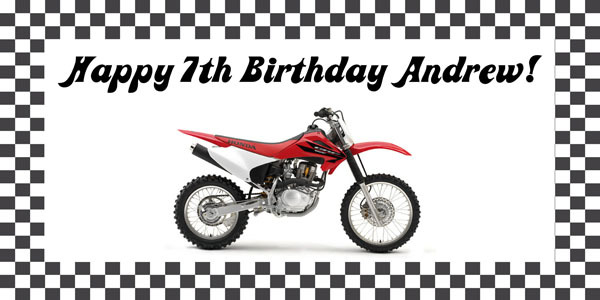 Custom dirt bike birthday party banner, 4 feet by 2 feet indoor/outdoor vinyl banner. The banner is high quality with vibrant colors. Vinyl banners are very durable but lightweight at the same time. The personalized banner would make an excellent keepsake! Proofs via email or Text: REQUIRED. Banner proofs are emailed within 24-48 hours. Banners will not be shipped out until you okay the proof. Please allow up to 14 days once proof is ok'd for you to receive your personalized banner. Banners are shipped separately. FREE SHIPPING on all banners!